What is K undalini Yoga? Are you looking for an active, cleansing, yoga practice? 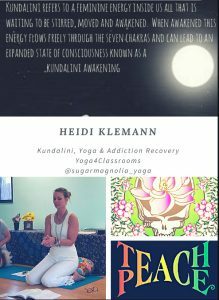 Kundalini might be just for you! This unique style activates you spine, naval, and chakra points to leave you feeling invigorated, strong, and creative. The traditional practice of Kundalini asks students to wear white to class; however, this is not a requirement. We would just love for you to give Kundalini a try! New Kundalini students are always welcome!